Today in Asian football corruption news, three grubby Lebanese match officials have been charged with receiving “sexual bribes” in return for fixing an AFC Cup match in Singapore. The dirty, dirty little ponies. 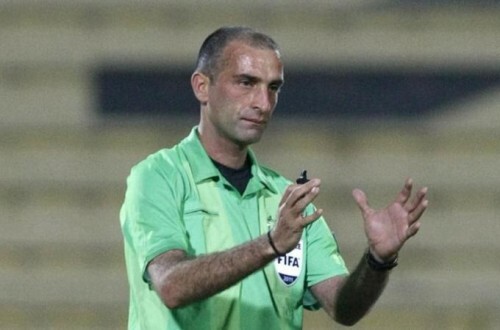 The Corrupt Practices Investigation Bureau (i.e, the CPIB: the Singapore government’s anti-match fixing agency) have confirmed that referee Ali Sabbagh and his two assistant referees Ali Eid and Abdallah Taleb were hastily replaced for the Tampines Rovers-East Bengal cup tie on Wednesday after it transpired that the officials had, as the CPIB put it, “corruptly received gratification in the form of free sexual service” in return for throwing the match. The three men have all been charged with “accepting a fiddle for a fiddle” or whatever the official description is and are likely to be struck from the match officials register if found guilty as Singapore have a newly adopted zero tolerance policy when it comes to match rigging – though they’ll probably still find themselves in charge of organising the FIFA Christmas party come December. with men or women? i need to know whether or not it’s worth preparing my masturbation kit or not.